Investors are right to be worried about agricultural reform. They’re wrong about the reasons. Even though South Africa’s ruling African National Congress party is not in favor of expropriating white farmers’ land as was done in neighboring Zimbabwe, investors are right to worry about the ANC’s land-reform deliberations. The fundamental problem that’s causing them will not go away by itself. The South African constitution already allows the government to expropriate land without compensation “for a public purpose or in the public interest.” But the far-left Economic Freedom Fighters party, which has 25 seats in the country’s 400-seat National Assembly, has tried to push through a constitutional amendment that would set down more clearly that land can be taken away from owners if the government deems it necessary. The ANC, whose parliamentary majority feels precarious ahead of next year’s election, has moved to take ownership of the issue, and late on Tuesday, President Cyril Ramaphosa announced that the amendment would go ahead. This drove down the South African rand, a sign of investor dismay, but the currency later recovered as the markets concluded that nothing more serious than electioneering was taking place. That’s essentially the position of some insiders, such as former ANC legislator Melanie Verwoerd. It still remains to be seen exactly how the constitution will be amended, and Ramaphosa, who has pledged to attract $100 billion in foreign investment to South Africa in the next five years, has long emphasized that land expropriation shouldn’t threaten economic growth. Such an approach would rule out what happened in Zimbabwe after 2000, when former President Robert Mugabe announced the so-called fast track land reform — the seizure of about 4,500 farms owned mostly by whites, and their redistribution among more than 200,000 black Zimbabwean families. The campaign was marked by violence, led to an agricultural production collapse and put many of the new farmers at the mercy of local officials. It helped turn Mugabe from a national liberation hero into the pariah dictator who only gave up power reluctantly last year at the age of 94. His party, ZANU-PF, appears, however, to have held on to power in a hotly contested election, the results of which are still coming in. That makes any change for the better in ensuring property rights unlikely in the foreseeable future. Though Ramaphosa and the ANC won’t rush headlong into a Mugabe-style land grab, South Africa has a land ownership problem akin to Zimbabwe’s pre-reform one. Under apartheid, most land was owned by white South Africans, and though the regime fell in the early 1990s and an equitable land reform was enshrined in the constitution, white commercial farmers have retained two-thirds of the country’s agricultural land. 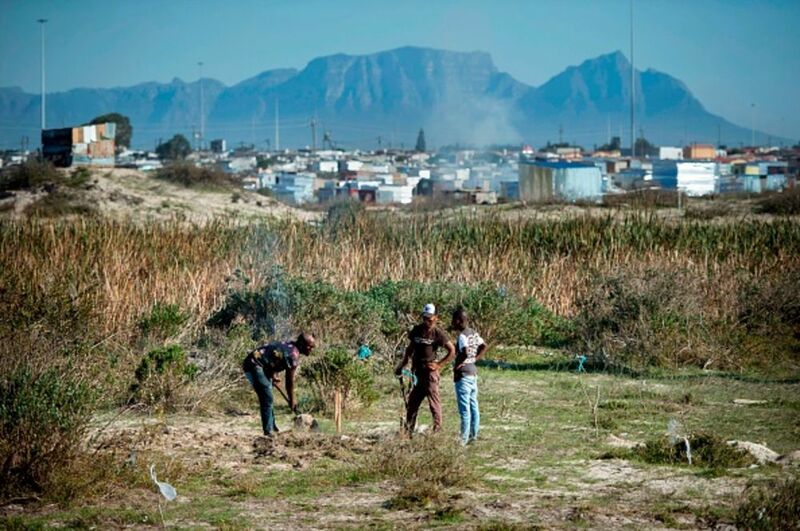 ANC governments have taken a conservative approach to land redistribution. At first, in the 1990s, black South Africans received grants and subsidies to buy land plots, which resulted in overcrowding and poor land use. Then, just as Mugabe bulldozed his country’s white farmers, President Thabo Mbeki prioritized helping black citizens buy into large-scale farming, and those who took advantage of the new policy ended up deeply indebted and barely able to compete. Under President Jacob Zuma, who resigned in February after almost nine years in the job, the government started buying up land for temporary redistribution through leases rather than property transfers. Through it all, however, the land reforms remained market-based rather than confiscatory, and since apartheid had left blacks and whites with unequal starting circumstances, the capitalist approach perpetuated the inequality. Situations in which people either have no documented rights, or have caretakerships or expired leases, produce high degrees of uncertainty, leading people to avoid investment in land use, production or maintenance of infrastructure. This means that "beneficiaries" have little or no tenure security. In a twist of Orwellian irony, the "beneficiaries" may not benefit at all, but are allowed to be temporary squatters on land over which they have no rights. That’s a situation that can hardly be fixed by increasing the government’s power to seize land without compensation. The country needs both a framework for giving farmers a solid tenure on the land they use and a better mechanism for redressing the persistent economic inequality inflicted by apartheid. Ramaphosa has mentioned the South Korean land reform, started in 1950, as a positive example. “We will explain to potential investors that land reform is not incompatible with agricultural productivity and economic development, as the historical experience of some East Asian economies, such as South Korea, demonstrates,” he told the parliament in May. That reform was confiscatory in that it offered Korea’s large landowners relatively little compensation — 150 percent of the average value of a year’s crops. They were encouraged to invest the money in industrial production, with the government guaranteeing cheap loans. The land was handed to the former tenant farmers, who were obliged to work it and to pay for it in installments. Though most of the landowners and many of the farmers subsequently went bankrupt, the reform is considered successful because it changed the structure of Korean society and removed the tension between the farmers and the landlords. Ramaphosa appears to believe that something like South Korea’s painful transformation is necessary in South Africa, too — and he might be right after two decades of half-measures. If the ANC embarks on it under the pressure it feels from the left, ramifications could be serious for investors. South Africa’s persistent inequality problem and the tension it creates should be a bigger worry for them than the constitutional change being discussed.